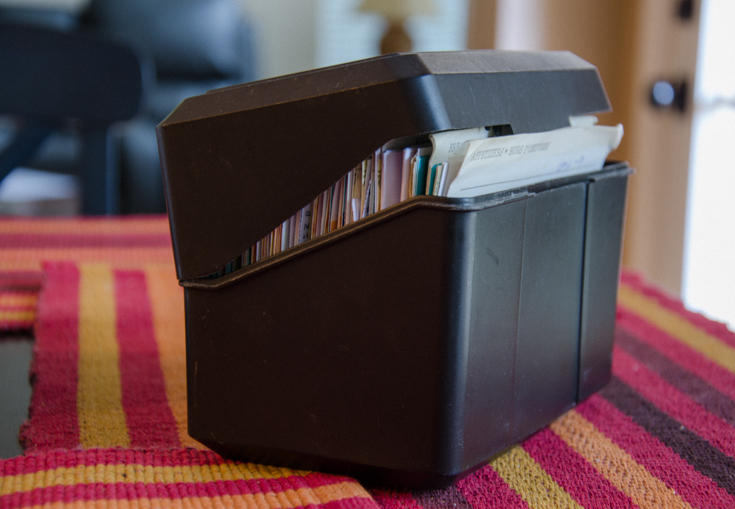 This is my recipe box, filled with cherished dishes that I’ve been collecting and perfecting for the last 14+ years. So when I became gluten-free and dairy-free, I shed a little tear for some of my favorite meals in here. But do I have to? I’m determined to re-make most of the recipes in this box with healthy ingredients that are part of my new eating plan. On this site I’ll be sharing them with you, plus some others I develop along the way. I am very careful not to label these recipes as “healthy.” As I’m learning in my discussions with other people with MTHFR and chronic illness, what may be “healthy” for one person isn’t always for another. Many of us have food allergies or require a more restricted diet to assist with our conditions. Hopefully I will get enough variety in the foods I make so that there is something for everyone. I wanted to put this disclaimer here so that you aren’t confused that these recipes are necessarily going to agree with you or act as a treatment for MTHFR or related conditions. I am mostly seeking to publish gluten-free and dairy-free recipes that are easy to prepare and contain beneficial ingredients.